Some of the most difficult issues faced by small- and mid-sized cities and towns seem to revolve around pension reform, tax caps and decreased federal funding for infrastructure. Even given these situations, however, municipalities accomplished a great deal in 2014. In some cases natural disasters forced rebuilding projects; in others, the penchant of millennials to renovate instead of building new is changing the local modus operandi in a marked way. Some of the many efforts deserving applause this year include the following. These accomplishments made not only the cities involved proud, but their states and municipal associations as well. 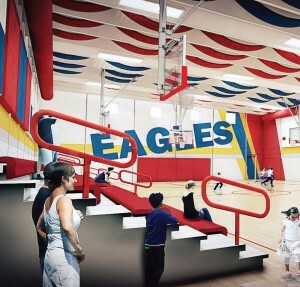 Following an EF-5 tornado that demolished several schools and razed the city of Joplin, Mo., the Joplin School District tornado safe room project has created safe space for hundreds of students and local community members. “The Joplin safe room projects are the most obvious accomplishments in terms of significance, due to the devastating tornado that destroyed so much of Joplin in 2011,” said Elizabeth Weyrauch, hazard mitigation officer for the Missouri State Emergency Management Agency. The cost of the construction was shared by FEMA and JSD. 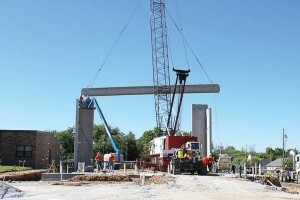 Construction began in Octber 2013 on the 7,000-square-foot, precast structures, which are attached to school buildings. Seven sites are completed with seven more at some juncture of the construction process. On average 800 to 1,500 people can be sheltered in each, and the structures are designed to withstand winds of up to 250 mph. In advance of tornado watches, warnings and severe weather events, the centers will be opened to receive members of the community. The doors can also be opened remotely after hours with a beacon serving as visual indication that this has happened. When threatening weather is absent, the rooms will serve as gymnasiums and other gathering spaces for students. Farther south, an eyesore in the city of Branson, Mo., was all but erased this year thanks to a Community Development Block Grant. Back in August 2011, just a few months after Lake Taneycomo twice swallowed the lakeside homes, Taney County initiated a Federal Emergency Management Agency Hazard Mitigation Grant Program buyout for eight homes damaged beyond repair. Although Branson is one of only a handful of active/current buyout projects in the state, as Weyrauch pointed out, Branson is a high-profile area that depends on tourism. Remediating problems in such high-profile areas supports the economy of both the city and its environs. The federal program provided funding for homeowners for 75 percent of the pre-flood value of the homes, and a Missouri Department of Economic Development Community Development Block Grant that was approved later covered the remaining 25 percent. The homes will be purchased by the county and are in the process of being demolished. The land will be maintained by the county. Thorp, Wis., annexed a 100-acre parcel in 1998 at the urging of a developer with big plans. That development, along with subsequent development attempts, never came to fruition. The land continued to sit vacant and idle. Holland’s Family Cheese had been making cheese since 2006 in a smaller creamery located several miles out in the country on a dirt road. After being quite successful, winning numerous awards and seeing a huge increase in the demand for its cheese, the company approached the city wanting better highway access, more visibility, a larger creamery and an agritourism slant. The city’s tax increment financing district was already in place and was nearing the end of its expenditure period, so the transportation economic assistance grant was crucial in making the project viable. According to City Administrator Randy Reeg, the company started milking there in December 2013 and then started cheese production at the new creamery in March 2014. “Since opening in their new location, we’ve seen an increase in traffic coming off of the highway. These travelers are not only stopping there for cheese, but they’re coming to our gas stations, our restaurants, our hotels and our downtown. They’ve definitely had an impact on the community,” he said. Over the summer the village of Kronenwetter was successful in receiving a Local Spark grant from Wisconsin Education Association Trust. The grant exists to reward efforts to initiate, preserve or revive local projects for which local residents have demonstrated support. In the case of Kronenwetter the $2,500 will replace an aging computer projector and DVD player with new technology, reinvigorating a much-loved outdoor movie night. Kronenwetter’s Movie Under the Stars brings together more than 200 citizens for a night of free fun in one of the village’s parks. Using special-purpose, local option sales tax funds, the city of Waycross, population 14,000, has restored a historical icon while simultaneously creating a state-of-the-art, multipurpose facility. City Auditorium, a 15,000-square-foot structure built in 1937 with Works Progress Administration funds, once hosted some of the most acclaimed entertainers in the world, including Elvis Presley, Ella Fitzgerald, Johnny Cash, Louis Armstrong, Otis Redding and James Brown. Over the years the space was used for a number of different purposes, including offices for city workers during a City Hall restoration in the 1980s. During construction Waycross was able to maintain the historic shell of the building and much of the original architecture. It sourced much of the labor and supplies locally, spending approximately $600,000 or 40 percent of construction costs with local businesses that included 11 local subcontractors, building materials and appliances. A reopening ceremony took place in February, and the renovation of City Auditorium is benefiting both Waycross and Ware County. Eleven years in the making, the Lawrenceville Lawn also held a grand opening celebration in 2014. 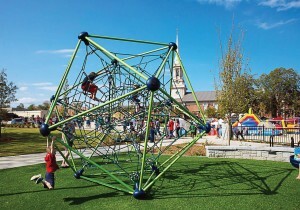 A $4 million amphitheater, playground, interactive fountain and grass-covered public gathering space was developed in a central and heavily trafficked location in the Atlanta suburb. Part of the city’s Jackson Street Master Plan, the project intended to create a sense of place and maximize the connection between the downtown, a historic courthouse and city hall that both lie just one block off of the lawn and the city police station. An amphitheater further expands the use of the space. Economic Development Director Lisa Sherman said the Lawrenceville Lawn was designed to meet the needs of a rapidly growing city that is not only the county seat but which, along with the county, is experiencing dynamic growth. The majority/minority city features a university campus and three colleges, country government services, the county fairgrounds and more. “We’ve really got a synergy going on that brings people together in that geographic area. Now we’re in a position to capitalize on it,” Sherman said. 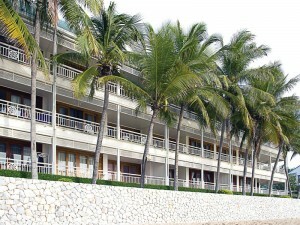 Following pressure from the Florida League of Cities in early 2014, the Sunshine State legislature removed a problematic vacation rental property regulation preemption. In 2011 the legislature had passed a law preventing local governments from regulating the rentals. The state felt city ordinances were too restrictive, that they eroded private property rights and that they discouraged investment in the housing market. The cities counter-argued that too little oversight of commercial businesses could expose guests to dangerous situations, create unfair competition in the tourism industry and adversely impact local land planning decisions. In the May/June issue of the league’s Quality Cities magazine, the FLC reported that the 2014 legislature removed the preemption from the law with the exception that vacation rentals cannot specifically be banned, nor can the length of the rental duration be regulated. Municipalities are now authorized to adopt ordinances for vacation rentals to address parking, noise and other issues often associated with rental properties. By DOUGLAS SMITH | stormwater intern; Department of Public Works, Lancaster, Pa. 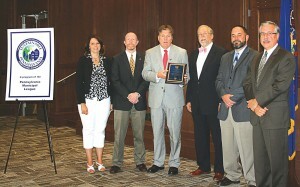 The city of Lancaster, Pa., was the first Gold Sustainable Pennsylvania Community under the Pennsylvania Municipal League’s Sustainable Pennsylvania Community Certification, meeting the program’s rigorous performance criteria by tracking 131 policies and practices used to define a sustainable community. Under the leadership of Mayor Rick Gray, Lancaster has defined a unique path toward a sustainable future that includes a more efficient solid waste and recycling collection and disposal system, an innovative stormwater management program and a growing culture of sustainability through partnerships. Lancaster initiated what has become a national success story with its innovative Green Infrastructure Plan. Green Infrastructure projects, such as rain gardens, vegetated curb extensions, porous basketball courts and bioswales, use natural systems that allow stormwater to infiltrate into the ground using natural systems to treat the stormwater. The city has become a laboratory for pioneering stormwater management strategies, and cities throughout the nation are following its lead. The notion of sustainability requires a commitment of all residents to become better stewards. Lancaster works alongside nonprofits, business leaders, residents and neighboring governments to help create a culture of stewardship and cooperation. Edited from original article and submitted by the Pennsylvania Municipal League.